Cancer is an unbelievable weight on a child’s life. At home and at school, physically and emotionally, it changes everything. Their days become increasingly defined by a shuffling between appointments—hospital to hospital, treatment to treatment. • Childhood is invaluable. We give kids the opportunity to run and play, to laugh and learn, to practice a favorite hobby or try something new. • Community is an incredible source of strength. We offer them a space to meet people and make friends, to share stories and inspiration. • Our campers are unstoppable. We encourage them to take on the world. Kids possess an inherent strength—the bravery to live, not just with cancer, but boldly and beautifully in spite of it. They are open-mined and open-hearted—they empower each other to push beyond the bounds their diagnoses. Camp One Step, inspired by our campers’ determination, is dedicated to moving forward together. Camp: has become a home to our community. Lifelong friendships have been formed, and the word CAMP represents joy, happiness, family and togetherness. One: symbolizes that we are all together. No one is different, and we are never alone. We are one. Step: symbolizes moving forward together, that any achievement is possible if you believe in yourself, and knowing that your camp family always believes in you. Our community of campers, families, volunteers, donors, Board members and staff is what makes us special. Throughout the process, we have focused on our special community, forward movement, and taking the journey of a cancer diagnosis together through camp. The new logo includes the ribbon colors for some of the cancers that are seen at camp. 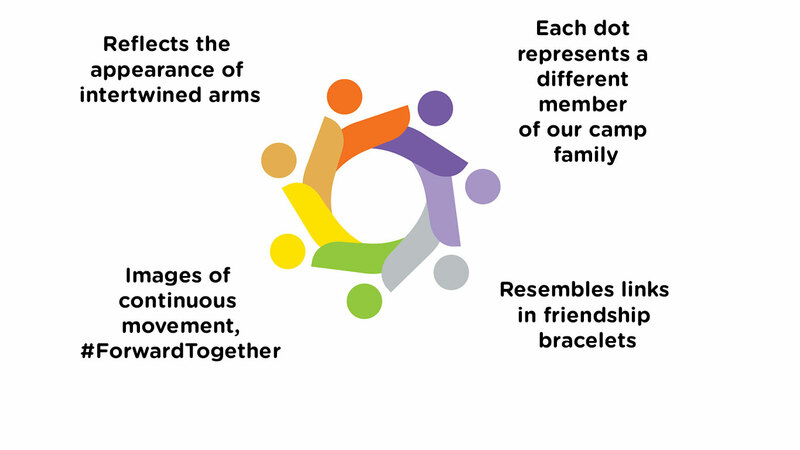 This color palette brings additional meaning to the new brand, representing our community.